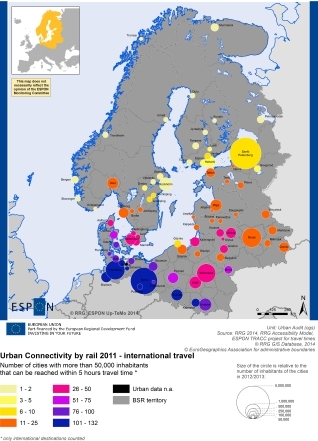 Name: Urban connectivity by car, rail and air in 2011. Abstract: This file contains the indicator urban connectivity 2011 by car, rail and air, defined as the number of cities with more than 50,000 inhabitants that can be reached within 2 hours (domestic) and 5 hours (international) car, rail and air travel times. Keywords: accessibility, territorial structures, regional structures, integrated polycentric territorial development, social aspects, population, connectivity, travel time, urbanization, urban structures, spatial structures, cities.